When Buzz Potter's grown children asked him to write down his experiences riding the rails in his youth, no one was more surprised than Buzz when the words came to him in the form of poetry. Potter always harbored an extreme fondness for the freedom and independence he encountered while being a "hobo on the road". Initially, Buzz took to the trains just for the sheer boyish adventure of it but later he became a "boomer" or traveling worker on the hobo road. Along the way, he discovered it to be a profound learning event that taught self-reliance, discipline, optimism, empathy for his fellow man and a deep appreciation of America. 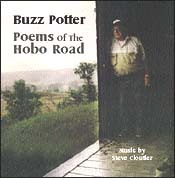 The CD, Poems of the Hobo Road is a collection of poetry written and narrated by Buzz Potter. With his deep, earthy voice, Potter paints vivid pictures of the hardship, adventure, camaraderie and the fascinating characters he encounters crossing the expansive American landscape. The 65 minute/12 poem collection is an artistically drawn view of a unique time and way of life through the eyes of a man who lived it. The tales he weaves are at times gritty, beautiful, historic, and always engrossing. 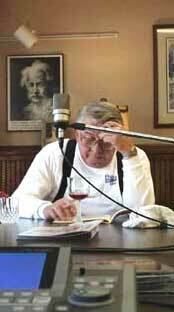 Utah Phillips, the nationally known traveling folk singer, and storyteller says, "... Buzz Potter speaks from the heart to the heart; if the Traveling Nation wants a Hobo Poet Laureate, here he is." The spoken portion of the CD was recorded in December 1999 at Potter's lakeside home in Nisswa, Minnesota. Then over the next few months Cloutier composed and recorded the music that underscores the many moods of the narration. Buzz Potter died March 9, 2003.